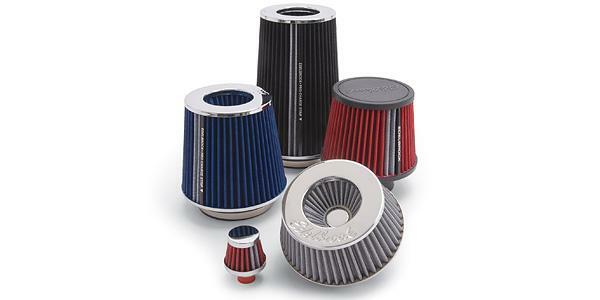 Edelbrock Universal Pro-Flo Conical Air Filters are an economical way to ensure your engine is getting clean air, without the expense of buying a new filter every few thousand miles. They are constructed for superior filtration and air flow performance. The Universal Fit Series features triple chrome plated trim for a show-quality look. Available in black, red, white and blue, to complement any engine bay. They are also designed with three inlet adapter rings for use on 3”, 3.5” and 4” inlet tube systems. They also feature the Edelbrock exclusive Pro-Charge™ clean strip for easy maintenance. The Pro-Charge strip will let you know when it’s time to clean your filter. Each filter is washable and reusable. Use Edelbrock Pro-Charge Cleaning Kit #43600 to clean and re-oil.